Background: In clinical practice, it is important to quickly and effectively treat manic episodes in patients with bipolar I disorder. Therefore, it is necessary to formulate an effective therapeutic protocol combining two or more drugs in order to rapidly alleviate symptoms within a short time frame (1 week). In this clinical trial protocol, the antipsychotics quetiapine, olanzapine and ziprasidone and the mood stabilizers valproate, oxcarbazepine and lithium will be used to treat manic episodes to investigate the efficacy and safety of these two types of drugs when used alone or in combination. Methods/Design: This trial will be performed at Guangzhou Brain Hospital, China. A total of 120 patients with bipolar I disorder, exhibiting manic or mixed episodes, will undergo two phases of medication. In the first phase, patients will be randomly assigned to receive oral valproate, oxcarbazepine, lithium, quetiapine, olanzapine or ziprasidone. In the second phase, combination drug treatment will be given, i.e., each patient will receive a combination of mood stabilizers and antipsychotics. Treatment will be given for a total of 6 weeks. Primary outcome measures will include changes in the Young Mania Rating Scale (YMRS) scores and dropout rates. Secondary outcome measures will include disease progression and the efficacy of treatment as evaluated with the Clinical Global Impression Scale, symptom severity as evaluated with the Global Assessment Scale, and anxiety and depression symptoms as evaluated with the Hamilton Anxiety Scale and the Hamilton Depression Scale, respectively. Discussion: This trial will provide preliminary evidence on the comparative efficacy and effectiveness of the commonly prescribed drugs, with attempts at optimizing pharmacological treatments of manic and mixed episodes. Trial registration: ClinicalTrials.gov identifier: NCT01893229; registered on 2 July 2013. Bipolar disorder, also called bipolar affective disorder, is an affective disorder characterized by manic or hypomanic and depressive episodes of unknown etiology. The disorder has complex clinical manifestations and high morbidity, recurrence and mortality rates, and is frequently under or misdiagnosed. The disease incurs a heavy economic and emotional burden on patients and their families (Correll et al., 2000; Cipriani et al., 2011). The development of effective treatment methods for bipolar disorder is a major area of interest in the field of mental health. Medication is the primary treatment method for bipolar disorder, while psychotherapy is used as an adjunct modality. Common drugs include conventional mood stabilizers, antipsychotics and antidepressants. Mood stabilizers are the core drugs in the treatment of bipolar disorder, and lithium, oxcarbazepine and valproate are commonly used. However, the therapeutic efficacy of single mood stabilizers is not satisfactory. Antipsychotics in combination with mood stabilizers and antidepressants are increasingly used to treat bipolar disorder (Tarr et al., 2011). Tarr et al. (2011) performed a meta-analysis of nine randomized double-blinded controlled trials involving 1,631 patients, and found that antipsychotics are more effective and safer in the treatment of acute mania than mood stabilizers, and therefore should be preferred treatment. In Europe, antipsychotics are the preferred drugs for the treatment of mania. Currently, however, effective treatment for manic episodes of bipolar I disorder are lacking. Consequently, an effective therapeutic protocol is needed to treat symptoms within a short time period (within 1 week), and therefore two or more drugs should be used in combination to rapidly control symptoms. The American Psychiatric Association's Practice Guideline for the Treatment of Patients with Bipolar Disorder indicates that a combination of lithium or sodium valproate and antipsychotics is preferred treatment for severe manic or mixed episodes of bipolar disorder. Indeed, numerous recent studies show that a combination of mood stabilizers and new generation antipsychotics is more effective than single mood stabilizers in patients with bipolar disorder, and have a substantial advantage in both acute and maintenance treatment of bipolar disorder accompanied by psychotic symptoms. Based on current clinical drug use for the treatment of bipolar I disorder, this study protocol is designed to investigate the following through a randomized controlled two-phase clinical trial: (1) the efficacy and safety (tolerance) of common antipsychotics (quetiapine, olanzapine, ziprasidone) and mood stabilizers (valproate, oxcarbazepine, lithium) used singly; (2) which combination of antipsychotics and mood stabilizers shows enhanced therapeutic efficacy in patients in whom single mood stabilizers or antipsychotics are ineffective or do not show clear therapeutic effects. This prospective, single-center, randomized, controlled, two-phase clinical trial will be performed at Guangzhou Brain Hospital, China. A total of 120 patients with bipolar I disorder, exhibiting manic or mixed episodes, undergoing treatment at Guangzhou Brain Hospital, China will be included in this study. In the first phase, patients will be randomly assigned to receive oral valproate, oxcarbazepine, lithium, quetiapine, olanzapine or ziprasidone. The starting dose will be increased to effective dose within 2 days for each drug. The effective doses for these drugs are as follows: lithium, 750-2,000 mg/d (serum Li: 0.6-1.2 mM); valproate, 800-1,200 mg/d (serum valproate: 70-120 μg/mL); oxcarbazepine, 600-1,200 mg/d; quetiapine, 600-800 mg/d; olanzapine, 10-20 mg/d; ziprasidone, 80-160 mg/d. In the second phase, combination drug treatment will be performed, i.e., each patient will receive a combination of mood stabilizers and antipsychotics if single mood stabilizers or antipsychotics are ineffective or the therapeutic effects are not obvious ([Figure 1]). TESS: Treatment Emergent Symptom Scale; HARS: Hamilton Anxiety Rating Scale; HDRS: Hamilton Depression Rating Scale. This study protocol was approved by the Ethics Committee of Guangzhou Brain Disease Hospital of China (approval No. 2012051). A researcher or another designated member of the team will explain in detail the trial protocol and how patient information will be processed to the patient, family members and guardians, and signed informed consent will be obtained before the trial. The trial protocol will be performed in accordance with the Declaration of Helsinki, formulated by the World Medical Association. In the first phase of the trial, randomized grouping will be performed by a researcher who will not participate in the trial. Each patient will be assigned a randomized number generated by the SAS 9.0 software, and then patients will be randomly divided into the following six groups: lithium, valproate, oxcarbazepine, quetiapine, olanzapine and ziprasidone. Patients and their family members will be blinded to grouping, but grouping information will be disclosed to the nurses responsible for dispensing who will not participate otherwise in the trial. In the lithium group, lithium carbonate tablet will be given orally with an initial dosage of 750 mg/d, and the dosage will be gradually increased until the maximum dosage of 2,000 mg/d is reached at the end of the 2 nd week. The dosage of lithium carbonate will then be adjusted to achieve a serum Li level of 0.6-1.2 mM. In the valproate group, valproate will be orally given with an initial dosage of 800 mg/d, and the dosage will be gradually increased until the maximum dosage of 1,200 mg/d is reached. The dosage of valproate will then be adjusted to achieve a serum valproate level of 70-120 μg/mL. In the oxcarbazepine group, oxcarbazepine will be orally given with an initial dosage of 600 mg/d, and the maximum dosage will be not more than 1,200 mg/d. In the quetiapine group, quetiapine fumarate will be orally given with an initial dosage of 600 mg/d, and the maximum dosage will be not more than 800 mg/d. In the olanzapine group, olanzapine will be orally given with an initial dosage of 10 mg (2 capsules, 5 mg/tablet) in the evening. From the second day, the dosage of olanzapine will be adjusted to be within 10-20 mg, in increments or decrements of 5 mg. In the ziprasidone group, ziprasidone will be orally given with an initial dosage of 80 mg/d, and the maximum dosage will not be over 160 mg/d. The duration of treatment for each of these drugs will be 1-2 weeks. In the second phase of the trial, patients will take another drug for combinatorial treatment if one of the following conditions occurs: (1) Those who have a reduction in YMRS scores less than 25% after 1 week of treatment; (2) those who have a reduction in YMRS scores less than 50% after 2 weeks of treatment; or (3) those who have an increase in YMRS score by more than 30% on day 4. An antipsychotic (quetiapine, olanzapine or ziprasidone) will be added on for those who were given lithium, valproate or oxcarbazepine as the first medication. Lithium, valproate or oxcarbazepine will be added on for those who were given an antipsychotic as the first medication. The treatment duration for each combination treatment will be 4-5 weeks. Thus, the full duration of the trial, including the first and second phases, will be 6 weeks. Patients who are recognized as non-responders/partial responders to the two combined medications after 6 weeks of treatment will be switched to modified electroconvulsive therapy (MECT). The evaluation criteria are as follows: a < 25% reduction in YMRS score or a score ≥ 4 in the Clinical Global Impression (CGI) scale is defined as non-effective; a 25-49% reduction in YMRS score from baseline or a score of ≤ 3 in the CGI is recognized as partially effective; a ≥ 50% reduction in YMRS or a score of 1 (very much improved) or 2 (much improved) in the CGI is recognized as clearly effective. YMRS score (Young et al., 1978): used to assess hypomania/mania symptoms in patients with bipolar affective disorder. A ≥ 75% reduction in YMRS score is defined as successfully treated, 50-74% as markedly improved, 25-49% as improved, and < 25% as no response. A YMRS reduction rate ≥ 50% will be considered to indicate effective treatment. YMRS reduction rate = (YMRS score prior to treatment − YMRS score after treatment)/YMRS score prior to treatment ×100%. Dropouts: patients who cannot complete the trial because of adverse reactions to the drugs used, poor compliance, or because of inability to contact them. CGI (Busner and Targum, 2007) score: used to evaluate global functioning; provides an overall clinician-determined assessment of illness severity, based on patient history, psychosocial circumstance, symptoms, behavior, and the impact of the symptoms on the patient's ability to function. Brief Psychiatric Rating Scale (BPRS) (Overall and Gorham, 1962) score: used to assess psychotic symptoms. Global Assessment Scale (GAS) (Endicott et al., 1976) score: used to rate the general functioning of patients with bipolar disorder. Treatment Emergent Symptom Scale (TESS) (Hirschfeld et al., 2003) score: used to assess adverse events associated with the drug. Hamilton Anxiety Rating Scale (HARS) (Beck and Steer, 1991) score: used to assess anxiety symptoms in patients with bipolar disorder. Hamilton Depression Rating Scale (HDRS) (Williams, 1988) score: used to assess depressive symptoms in patients with bipolar disorder. The timing of the trial outcome evaluation is shown in [Table 1]. A researcher blinded to grouping will observe any adverse reactions the patient may experience and perform an evaluation using the TESS, and make a record on medical case notes for each interview. TESS includes adverse signs and symptoms as well as laboratory results. The onset time, severity, duration, measures and turnover of the adverse events will be recorded on medical case notes. The severity of adverse events will be rated, and adverse events positively and likely related to the medications will be assessed using the TESS. Adverse events will be clinically followed up until resolution or stabilization. The severity of adverse reactions will be graded with the 5-point TESS as follows: 0, no symptoms; 1, extremely mild or suspected; (2) mild, do not influence functioning, equivocal evidence of symptoms, or completely based on patient's report; (3) moderate, influences functioning to a certain degree, but does not greatly influence patient's daily life, patients can observe the symptoms because of uncomfortable feelings or restlessness; (4) severe, greatly influences patient's activity and daily life. Measures for adverse reactions will be on a 7-grade scale as follows: 0, no intervention; 1, intensify observation; 2, drug dose change; 3, use of antagonist drug; 4, drug dose change and use of antagonist drug; 5, suspension of treatment; 6, termination of treatment. During the trial, any adverse events and other unexpected reactions will be recorded, evaluated, reported, and investigated. Solutions will be proposed and outcomes will be recorded. The nature, severity and drug correlations of all adverse events will be identified and reported to the researcher in charge and the clinical ethics committee within 24 hours. After enrollment in the trial, detailed information on therapeutic protocol, study significance, and the importance of following physician's advice and oral and written explanations will be fully explained to facilitate patient cooperation with the physician and the trial. Nurses will be advised to consistently encourage and remind patients to take their medicine as per the physician's orders. During the trial, patients will be followed up regularly, and the therapeutic protocol will be adjusted according to the therapeutic effects and adverse reactions. The remaining drugs will be returned to the main trial site, and biological specimens will be collected to check patient compliance so that problems can be identified and resolved quickly. During the 6-week drug treatment period, a person will be designated by the person in charge to manage follow up interviews. If the hospital visit fails, telephone interview or family interview will be performed. Contact information (telephone, address and e-mail) of patients and their family members and friends will be collected to decrease the lost-to-follow-up rate. Data for patients lost to follow-up will undergo intention-to-treat analysis unless the patient asks for removal of the data. The reason for trial withdrawal will be recorded in the case report form and medical case notes. All data will be collected in case report forms and collated. The case report forms will contain complete information, including demographic data, disease diagnosis, accompanying disease, history of drug allergy, scale evaluation outcomes, and adverse reactions. The collected data will be input into an electronic database using the double-data entry strategy by professional staff. Information accuracy will be checked when all recruited patients are followed up. The database will be locked by the researcher in charge and will not be altered. All information relating to this trial will be preserved by Guangzhou Brain Hospital, China. The electronic database will be fully disclosed to a professional statistician for statistical analysis. Following the statistical analysis report, the researcher in charge will make a report of the trial. An independent Data-Monitoring Committee will monitor and administer the trial data throughout the trial to ensure a robust scientific study process, and to ensure the validity and completeness of data. All data will be processed by statisticians using SPSS 20.0 software. Fisher's exact test will be used to compare numerical data between groups. When the numerical data are normally distributed, one-way analysis of variance will be used for homogeneity of variances, and Tamhane's T2 test will be used for heterogeneity of variance. When numerical data are abnormally distributed, the Kruskal-Wallis rank sum test will be used for investigating baseline balance and comparability between groups. Repeated measures analysis of variance will be used for comparison of scale scores across different time points between groups. Paired t-test will be used for comparison of scale scores in each group before and after treatment. A chi-square test will be used for comparison of dropouts between groups. P < 0.05 will be considered statistically significant. Mood stabilizers and/or antipsychotics are commonly used for the treatment of bipolar disorder (Shen et al., 2009). We plan to conduct a prospective randomized controlled two-phase trial to investigate the efficacy and safety of three commonly used antipsychotics (quetiapine, olanzapine and ziprasidone) and three mood stabilizers (lithium, valproate and oxcarbazepine) in the treatment of manic episodes of bipolar I disorder. Previous studies have mainly focused on the therapeutic effects of one or two mood stabilizers and antipsychotics used singly or in combination, for example, the therapeutic effects of quetiapine, olanzapine or lithium used singly or quetiapine combined with valproate in the treatment of manic episodes in bipolar disorder (Li et al., 2008; Tan, 2005; Yang et al., 2008). In comparison, this proposed trial will use a variety of different drug combinations, which better reflects the complex situations in daily clinical practice. Our drug trial should provide novel data on the optimal use of mood stabilizers and antipsychotics in the clinical treatment of manic episodes in patients with bipolar disorder. The study team led by GX, one of the authors, performed a series of related studies, and their study outcomes are shown in [Table 2]. GX and KL conceptualized the project and prepared the protocol. KL drafted the manuscript. TL, KC, WL, and JK retrieved the literatures and prepared the materials. All authors agreed to the final version of this paper for publication. American Psychiatric Association (2002) Practice guideline for the treatment of patients with bipolar disorder (revision). Am J Psychiatry 159(4 Suppl):1-50. Beck AT, Steer RA (1991) Relationship between the Beck anxiety inventory and the Hamilton anxiety rating scale with anxious outpatients. J Anxiety Disord 5:213-223. Busner J, Targum SD (2007) The clinical global impressions scale: applying a research tool in clinical practice. Psychiatry (Edgmont) 4:28-37. Chinese Society of Psychiatry (2001) Chinese Classification of Mental Disease (3 rd ed). Jinan, China: Shandong Science & Technology Press. Cipriani A, Barbui C, Salanti G, Rendell J, Brown R, Stockton S, Purgato M, Spineli LM, Goodwin GM, Geddes JR (2011) Comparative efficacy and acceptability of antimanic drugs in acute mania: a multiple-treatments meta-analysis. Lancet 378:1306-1315. Correll CU, Sheridan EM, DelBello MP (2000) Antipsychotic and mood stabilizer efficacy and tolerability in pediatric and adult patients with bipolar I mania: a comparative analysis of acute, randomized, placebo-controlled trials. Bipolar Disord 12:116-141. Endicott J, Spitzer RL, Fleiss JL, Cohen J (1976) The global assessment scale. A procedure for measuring overall severity of psychiatric disturbance. Arch Gen Psychiatry 33:766-771. Hirschfeld RM, Baker JD, Wozniak P, Tracy K, Sommerville KW (2003) The safety and early efficacy of oral-loaded divalproex versus standard-titration divalproex, lithium, olanzapine, and placebo in the treatment of acute mania associated with bipolar disorder. J Clin Psychiatry 64:841-846. Li CY, Miao GD, Xu GY, Chen C, Qiu B, Yang G, Lu CY, Huang JY (2014) Clinical manifestation of patients with bipolar disorder hospitalizing in psychiatric department. Guangdong Yixue 35:907-909. Li HF, Ma C, Wang G, Xie SP, Wang XP, Xu XF, Yu X, Gu NF (2008) Efficacy and saftety of quetiapine in the treatment of bipolar acute mania: a randomized, double-blind, lithium-controlled multicenter study. Zhonghua Shenjingke Zazhi 41:85-88. Lin Y, Cao LP, Li X, Ye BY, Wei HM, Xu GY (2011) Relation of bipolar disorder I and cognitive function to rs947267 polymorphism of G72 gene. Zhongguo Xinli Weisheng Zazhi 25:295-301. Overall JE, Gorham DR (1962) The brief psychiatric rating scale. Psychol Rep 10:799-812. Shen H, Zhang Y, Chen MJ (2009) Use of mood stabilizers and new antipsychotic drugs in treatment of two-way disorder. Shenjing Jibing yu Jingshen Weisheng 9:360-364. Tan RR (2015) Clinical effect of quetiapine combined with sodium valproate in the treatment of bipolar disorder manic. Zhongguo Dangdai Yiyao 22:125-126. 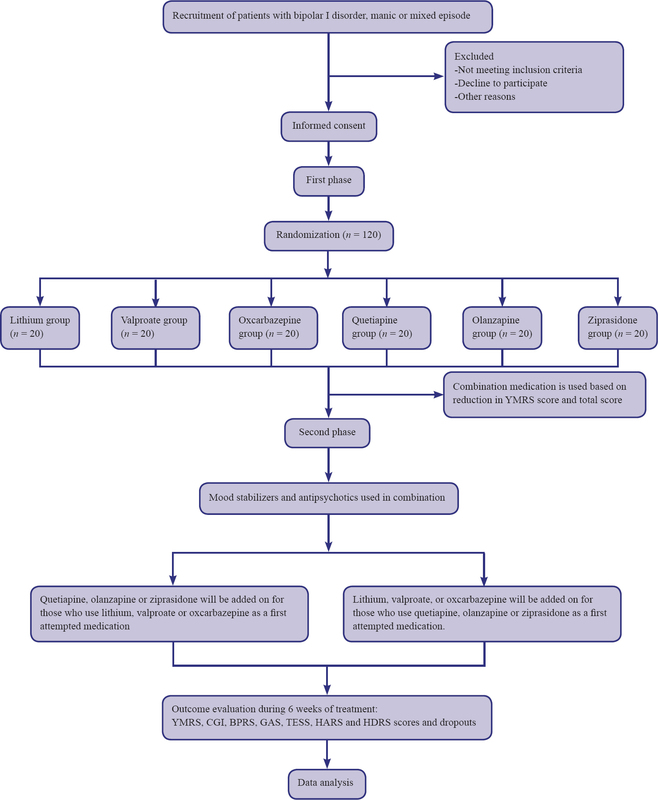 Tarr GP, Glue P, Herbison P (2011) Comparative efficacy and acceptability of mood stabilizer and second generation antipsychotic monotherapy for acute mania--a systematic review and meta-analysis. J Affect Disord 134:14-19. Williams JB (1988) A structured interview guide for the Hamilton Depression Rating Scale. Arch Gen Psychiatry 45:742-747. Yang FD, Li J, Chen DC, Bian QT, Yao FX, Shang L, Lan ZM, Tan ZL (2008) A random, blinded and controlled trial for evaluating the efficacy and safety of olanzapine and lithium in the treatment of bipolar or mixed type mania. Zhongguo Xinyao Zazhi 17:67-70. Young RC, Biggs JT, Ziegler VE, Meyer DA (1978) A rating scale for mania: reliability, validity and sensitivity. Br J Psychiatry 133:429-435.